With a hyperconverged hybrid cloud solution engineered and integrated by Lenovo and Microsoft, you’re free to focus on cloud services—instead of your infrastructure. Lenovo ThinkAgile SX for Microsoft Azure Stack is a turnkey, rack-scale solution optimized with a resilient, high-performing, and secure software-defined infrastructure. Microsoft Azure Stack is an extension of Azure, with an ever-growing subset of Azure cloud services. These services enable customers to select, provision and monitor the required services for their environments. The services enable Azure Stack to offer the same ease of use as is expected of a cloud environment and thus bring the agility of the public cloud to the private data center. Because the services are the same as they are in the public cloud, Azure Stack enables consistent cloud services across the Microsoft Azure environment. Azure Stack software is deployed on powerful, ultrareliable, and innovative Lenovo ThinkSystem SR650 nodes in a hyperconverged, clustered configuration engineered for high stability, resilience, and performance. A solution that’s offline is no solution at all. Therefore, the ThinkSystem SR650 2U server node is the perfect hardware platform for this solution. Equipped with two powerful Intel® Xeon® Scalable family processors, its extreme reliability, huge internal storage and memory capacity, and large number of I/O slots make it an ideal foundation for this solution. The SR650 configurations used in this solution are storage-dense, with a high-performance four-SSD caching tier and a ten-HDD data tier, along with two mirrored boot drives. You can start with as few as four nodes, and grow to twelve. Consistently scoring #1 for reliability* and #1 for customer satisfaction† in independent customer surveys, the SR650 provides the performance, availability, capacity, and quality your data center demands for a cloud environment. To handle your high-speed communications demands, each node is configured with a dual-port 10 / 25GbE Mellanox ConnectX-4 Adapter. This adapter is designed to address your virtualized infrastructure challenges. It utilizes native hardware support for RDMA over Converged Ethernet, Ethernet stateless offload engines, overlay networks, and GPUDirect Technology to maximize performance. The internal networking for this solution is 25GbE, provided by the cloud-optimized ThinkSystem RackSwitch NE2572. This enterprise-class Layer 2 and Layer 3 full-featured switch delivers line-rate, high-bandwidth switching, filtering, and traffic queuing without delaying data. Large data center-grade buffers help keep traffic moving, while the hot-swap redundant power supplies and fans (along with numerous other high-availability features) help provide resiliency for business-sensitive traffic. External connectivity is provided by six ports at up to 100GbE. The Lenovo Cloud Network Operating System (CNOS) for the NE2572 RackSwitch has been updated with Radius-Accounting/MSCHAPv2 and Public Key Infrastructure (PKI) support with enhancements to user transaction logging and IP ACL over L3 VLAN interfaces for Microsoft Azure Stack integration. All ThinkAgile solutions include a comprehensive portfolio of software and services that supports the full lifecycle of your infrastructure. At every stage—from planning to deploying, supporting, optimizing, and end-of-life— Lenovo provides the expertise and services you need to get the most from your technology investment. Lenovo will help you perform a presale TCO study to decide which configuration is right for you and then will ship it as a single unit, factory installed in a rack and ready to deploy. Configuration Services will discover your hosts and storage resources. Lenovo also will provide knowledge-transfer training to your IT personnel. After deployment, Predictive Analytics software will identify on a continuing basis — and usually resolve — storage related (and many infrastructure-related) issues, often before administrators are even aware of them. 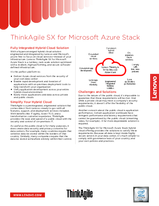 Lenovo provides single-point-of-contact support for all the hardware and software used in the solution, including Microsoft’s Azure Stack and the Mellanox adapters. So there will never be any finger-pointing. Periodic health checks enable you to maintain an optimized solution. At end of life, Lenovo offers data recovery services. And these are just a few of the many benefits Lenovo’s software, services, and support provided with your solution. The ThinkAgile SX for Microsoft Azure Stack solution allows you to budget more accurately for IT expenses, better deliver on service-level agreement commitments, and ultimately generate greater end-user satisfaction. With co-located engineering organizations and a history of technical collaboration, Microsoft and Lenovo consistently deliver innovative joint solutions for the data center. Lenovo’s leadership in reliability, customer satisfaction, and performance—combined with Microsoft’s leadership in software and cloud services—continues to deliver innovative data center solutions and lower TCO for our joint customers. Cloud-optimized ThinkSystem SR650 servers, factory-installed in a rack with Lenovo RackSwitch networking, form the foundation of the Lenovo ThinkAgile SX for Microsoft Azure Stack solution. * 2016-2017 Global Hardware, Server OS Reliability Report, ITIC, October 2016; and ITIC Reliability Study 2016 – 2017 Mid-year Update, May 2017. † 2H16 Corporate IT Buying Behavior and Customer Satisfaction Study, TBR; July 2017. Intel Select Solutions deliver preconfigured solutions optimized by Intel and Microsoft and validated and tested by Lenovo to provide high-performing infrastructure for modern computing needs. These solutions are built on Intel® Xeon® Scalable family processors and Intel P4600 NVMe cache tier devices, designed to accelerate performance and reduce latency. There are stringent performance requirements for this solution which have all been met or exceeded by our Azure Stack integrated systems. Simplified evaluation. IT managers spend considerable time determining how to optimize IT, including how to migrate their workloads and transition to software-defined infrastructure. Since Intel Select Solutions conform to rigid hardware and software requirements, they eliminate guesswork and speed decision-making. Lenovo prevalidates the solution, built on Lenovo’s #1 in server reliability, to provide confidence that your infrastructure will be available when you need it. Fast and easy deployment. With predefined settings and rigorous system-wide tuning, Intel Select Solutions are designed to increase efficiency in the IT testing process, speed time to service delivery, and increase confidence in solution performance.Workload-optimized performance. Intel Select Solution configurations are designed by Intel and their partners to deliver to a performance threshold for the workload, and are built on the latest Intel architecture foundation including the recently-launched Intel Xeon Scalable platforms. Lenovo ThinkAgile SX for Microsoft Azure Stack incorporates these components in our integrated system offering. Trademarks: Lenovo, the Lenovo logo, Lenovo XClarity, RackSwitch, ThinkAgile, and ThinkSystem are trademarks or registered trademarks of Lenovo. Intel® and Xeon® are trademarks or registered trademarks of Intel Corporation or its subsidiaries in the United States and other countries. Azure® and Microsoft® are trademarks of Microsoft Corporation in the United States, other countries, or both. Other company, product, or service names may be trademarks or service marks of others. Document number DS0013, published October 2, 2018. For the latest version, go to lenovopress.com/ds0013.